June is always a hectic month for me, and not just because of WWDC. The month of June contains more of my family and friends’ birthdays than any other month of the year. I have a cousin’s on the third, mine on the eleventh, my fiancée’s on the fifteenth, a family friend’s on the sixteenth, my niece’s on the nineteenth, and my mother and sister’s on the twenty seventh. Seven birthdays in thirty days. I’ve always had a hard time keeping track of everyone’s birthday, but never is that more apparent then during the month of June. But, this year I decided to make use of a feature that Apple has supported for the entire time I’ve been using their platforms — birthday calendar events. And, it’s incredibly easy to set up. 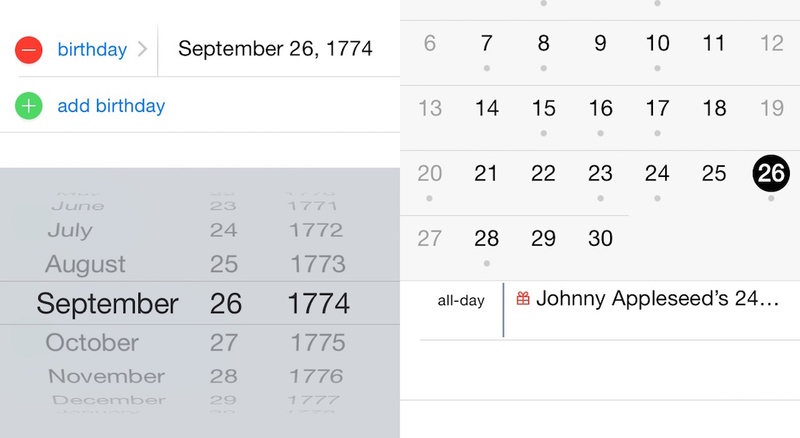 All you need to do is start adding birthdates to the contact information in your Contacts app and birthdays will start to appear in the Calendar app. And Contacts even asks for the year the person was born, so the calendar event will include how old that person will be on their birthday. I found this information invaluable when I was picking out a card for my niece — I knew she was turning five and picked out a birthday card accordingly. The other feature I turned on is notifications for these incredibly useful calendar events. Inside Settings; under Mail, Contacts, Calendars; and buried under Default Alert Times, there’s an option to turn on notifications for birthdays. I have mine set to two days before, which gives me just enough time to pick up a card or gift and serves as a reminder to send them a greeting on their birthday. But, Apple didn’t stop there. 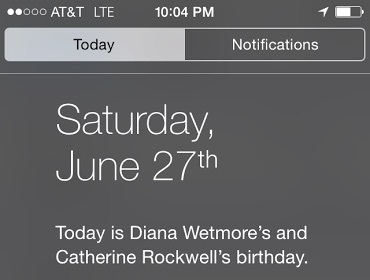 For those of you who, like myself, check their Today View every few hours, iOS offers a reminder the day before and the day of someone’s birthday — I no longer have an excuse for neglecting to acknowledge a friend or family member’s birthday. Now, I just need to finish inputting birthdates into my Contacts app so I can start seeing more of those tiny present icons in my calendar.